In the autumn of 1911 saw some of the biggest changes politically in China’s history. For the last 247 years China was ruled by the Qing dynasty. With failures to modernize China the people were becoming unhappy with Imperial rule and their ability to protect China from foreign powers. Several political anti-Qing groups with the purpose of creating change within the country sprang up all over China. Most of these also had support outside of China from Chinese communities living abroad, some if whom were in exile. Prior to 1911 there had been several attempts by particular groups to rise up and over throw the Qing rulers, all of which had failed. Then on April 27th an uprising occurred in Guangzhou, known as the Yellow Flower Mound Revolt. Huang Xing and approximately 100 armed revolutionary supporters forced their way into the Viceroy of Guangdong and Guangxi residence. Initally they were successful but the Viceroy was reinforced with Qing government soldiers. These additional soldiers turned the tide in the Viceroy’s favour, the uprising suddenly turned into a disaster with only a few of the revolutionary members escaping, including Huang Xing, though he has injured. In the aftermath 86 bodies were found though only 72 could be identified, most of whom were young men. One of those killed was a leading member of the revolution Lin Jie-min who on the eve of the uprising wrote a piece entitled A letter to my wife, which is widely considered a master piece in Chinese modern literature. In October later that year, the Qing government nationalised the railways, which had been built by private investors. This led to what has been called Wuchung Uprising , what made this one successful was the support from local military. On October 9th at the Russian Concession in Hankou Revolutionaries were planning an attack, whilst bombs were being prepared for this attack an accident occurred caused by an explosion. Sun Wu a local leader of the political group Progressive Association was injured along with several others. Those who were injured were taken to a local hospital for treatment and the staff suspecting something informed the local Qing government. Members of the New Army garrisoned in the city of Wuchung led a coup against the local authorities on October 10th. The local Viceroy of Huyuang Duan Zheng is tasked with tracking down the revolutionaries. In response to this Jiang Yiwu and the Literary Society launch an attack, but Qing agents are made aware of the attack resulting in several members being arrested and executed. On the evening of October 10th the New Army in WuChung stage a mutiny, this allows revolutionaries to take control of the Viceroy’s Government house/office. Duan Zheng managed to escape via a tunnel during the attack. Fierce fighting continued during the night for control of the city, with troops fighting street to street. The mutinied soldiers manage to capture key strategic places within the city leading to the defeat of government troops. 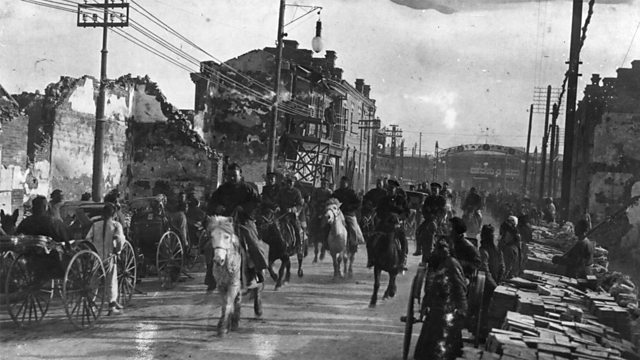 The battle of Yangxia was the largest military engagement of the 1911 revolution, lasting from October 18th to December 1st, a total of 43 days. The battle was waged in Hankou, Hangyang and Wuchang in Central China. The revolutionary army were outnumber and out gunned throughout the battle, they fought defiantly in the face of greater odds. On October 18th approximately 1,000 revolutionary soldiers launch an attack on Luijiamiao, a railway station guarding the Northern approach to Hankou. After fierce fighting on both sides the revolution army are driven back to Dazkimen. Later that day along with local railway workers they ambush a Qing troop train, killing 400 and derailing the train. The following day large numbers of volunteers join the Revolution army ranks, now numbering 5,000 strong they launch a second attack on Luijiamiao this time capturing the station. With morale high within the ranks of the revolution army, they press an attack Wushengguan but are driven back with heavy losses. Two days later the provinces Hunan and Shaanxi pronounce their independence from the Qing government. As a result of the events had occurred in the Wuchang region Yin Chang is removed as head of government forces and replaced with Yuan Shikai. Yuan Shikai’s first move as the new commander was to order the Beiyang Qing Army south on October 26th to attack the Northern Suburbs of Hankou, supported with heavy artillery and machine guns. In the fighting that ensued 500 soldiers of the revolution army were killed in action, they also lost control of Luijiamiao during the initial attack be later that day regained control of the station. The following day Qing troops captured and held the station, revolutionary troops were to try and fail to recapture the station for rest of the battle. On the 28th Tomgmenghui revolution leaders Huang Xing and Song Jiauren arrive. Huang takes control of the revolutionary forces. The following day he leads 1000 soldiers to Wuchang, where 6,000 are holding out to superior Qing forces. Feng Guozhang orders Qing troops to raze Hankou, the fires burn for three days and destroys much of the city. By November 1st Qing troops control Hankou, thousands on both sides are killed or captured in the fight for the city. Two days later soldiers from the Hunan province arrive to bolster the revolutionary army. By now eleven provinces have declared independence from the Qing government, along with elements of the Qing Navy defecting to the side of the revolution. Huang Xing, against advice attempts to retake Hankou on the 17th of November. Starting with an artillery barrage revolution troops cross the Han river. The artillery fire from the revolution side is inaccurate and ineffective, the right flank falters and is halted by artillery fire from the Qing army. The left flank manages to cross the river but is now venerable to a far superior Qing Army and were forced to make a retreat back across the river. Fours days after Huang’s failed attempt to retake Hankou, the Qing military launch an attack on Hengyang. The first element of the Qing forces bypasses revolutionary defences, whilst the second on the following day attacks crossing the Han river. They capture the strategic heights overlooking Hengyang. In response the revolutionary forces send reinforcements across the Yangtze river to Hengyang but suffer heavy losses on route. After seven days of fierce house to house fighting the Qing army slowly fights its way to the centre of the city capturing Hengyang Munnitions factory and revolutionary artillery positions on Guishan. On November 27th the revolutionary army retreats from the city having lost over 3,000 soldiers and volunteers during the battle. Yuan Shikai agrees to a 3 day ceasefire on December 1st , Sichuan province declares for independent rule from central government and revolutionary forces were threatening to capture Nanjing and Shanxi. On the 25th December Revolution leader returns from exile abroad to Shanghai. On the January 1st 1912 the Republic of China is founded. By Febuary 12th the last Emperor Pu Yi abdicates Qing control of China for the last 247 years. During the course of the revolution and civil war of 1911 there were several other uprisings and small scale actions throughout China. Though the largest military action were in the Wuchang area of China. Gaming this period can be done in several ways. Firstly you could refight the battle of Yangxia, though you will need to remember that Qing forces were superior in numbers and equipment. Also the majority of the revolutionary forces were volunteers, rather than military soldiers. An ideal way to play this period of Chinese history would be to start off with a small skirmish force of revolutionary activists building up to a large scale battle at the end of the campaign.